Photo of the West Garage project site July 20, 2017. 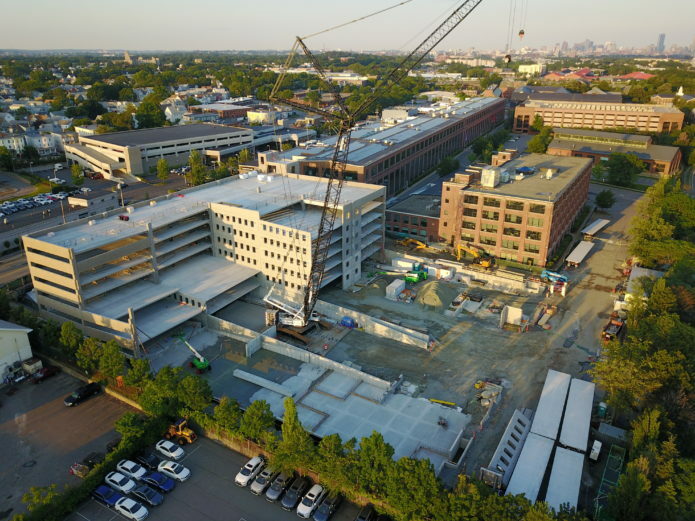 Shows the progress of the precast concrete structure, with building 39 and 311 in the background. The assembly of the precast concrete is going well and has crossed past the 50% mark of pieces being installed. 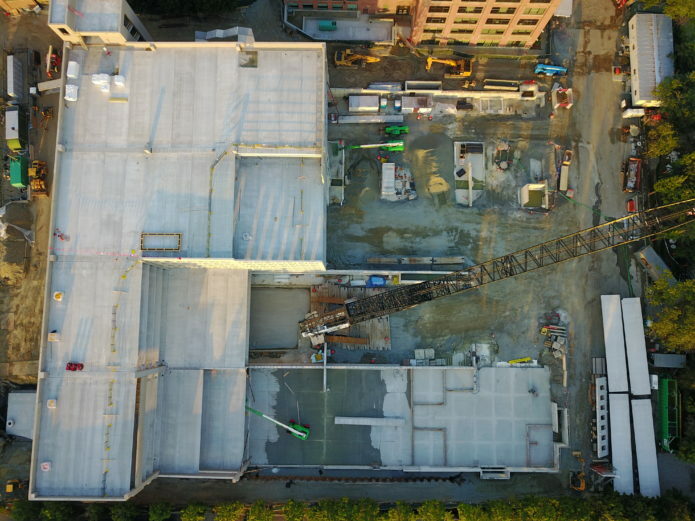 The most complicated, and therefore slower construction of the elevator tower close to building 311 is complete, and the structure continues to take shape. The schedule for precast currently has the assembly, and subsequently the delivery of pieces finished in early September. Delivery operations continue to be reviewed with DPW and are allowing for progress to be made, to finish this major phase of the project. The main entrance to site off School Street, has continued to be the primary route used to bring deliveries to campus. The project team has been coordinating with the Dept. of Public Works on the utility work on North Beacon Street to reduce impacts to either project. Overlooking shot of the project site, taken July 20th. Site activity has increased with the installation of many storm water structures. The site utility team is working hard to complete this work in parallel with the precast assembly. As precast sections are finished and released for other trades to work in safely, the project is working to start installing some of the systems into the garage ahead of full assembly. It’s like a constantly moving production line of trades! 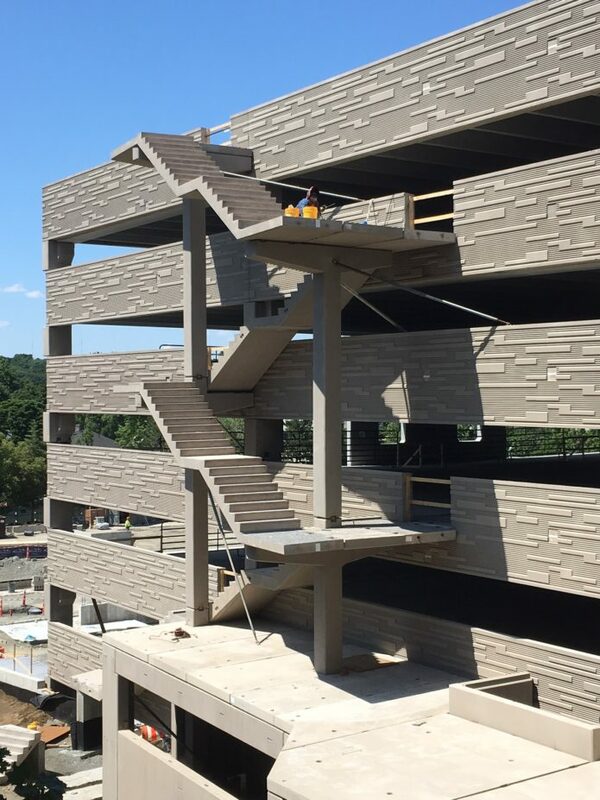 This image shows the new exterior ‘ornamental’ staircase on the east façade, with the new bike storage room below. The patterned panels here will continue around most of the exterior. July 10th, 2017. As the project plans for the completion of precast, it looks to install the architectural screening system and planters that will beautify the garage. These systems will start to be installed in September through October, and will be easily seen to make a positive visual impact. Additionally, over the next few weeks you will begin to see additional activity on Arsenal Street, as preparations are made for the installation of the new intersection. Also, the project will be making minor improvements to the intersection of North Beacon Street and Charles River Road; these are anticipated to start late summer. As a constant, the team remains the same as when construction started. With General Contractor C.E. Floyd Company, Inc., the Athena Arsenal LLC is working with PMA Consultants as the Owner’s Representative Project Manager. The athenaEnvironment Construction team is overseeing the project for Athena Arsenal LLC. There are many contractors and suppliers that are dedicated to making this project a success, both logistically and from the perspective of safety. The main point of contact for all project related questions received by the team remains as garage@athenahealth.com.